This set includes all program information and is the only set you need to buy for participation in both Course One: Tai Chi Fundamentals Adapted Program Basic Moves Training Course (formerly called Levels 1-2), and Course Two: Tai Chi Fundamentals Adapted Program Short Form Training Course. Practice with these materials before and after attending the training courses to help master the program. If you wish to become certified, you will need to demonstrate in-depth knowledge of the content of these materials as well. The Tai Chi Fundamentals® Adapted Program is designed to make tai chi accessible to people of all ages and abilities, and features versions for use with optional chair support, walker support, and when seated. 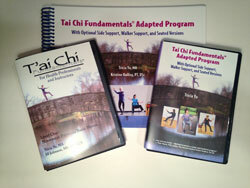 Learn more about Tai Chi Fundamentals Adapted Program.